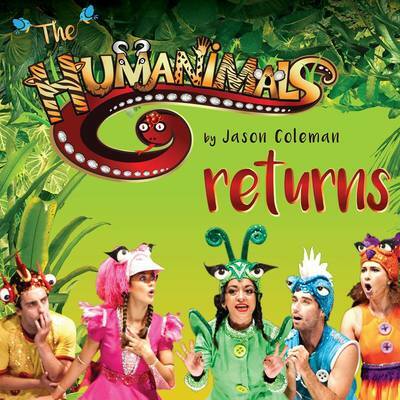 If your children love animals and energetic live shows, then you simply must take a trip down to the Mornington Peninsula this January, to watch Humanimals by Jason Coleman, performing at Cabaret Cathedral. Cabaret Cathedral is a temporary, travelling theatre, which currently sits on the shorefront of Rosebud, right after the inflatable water park. It's an interesting playhouse, because the entire Cabaret Cathedral construction is made up of repurposed shipping containers; you'd never know it, once you step inside the intimate space. This is the second year Humanimals has performed to audiences on the Mornington Peninsula, the first time being the summer of 2016, when Cabaret Cathedral sat on Rye's waterfront. The show is co-hosted by five performing artists who make up The Humanimals, each representing species of animal kingdom; an insect, reptile, bird, mammal and fish. Together, the cast of five put the question to the audience; which animal is the most important?, and in the hour that follows, extra cast members haul to the stage in an array of feathery, furry, shiny and beautifully coloured costumes, dressed in (animal) character. Which critter will be crowned the overall most important animal in the world? Will it be (Boy) George the singing chameleon? Charlotte the acrobatic spider, sparkling her way through the world-wide-web? Three happy footed tap dancing penguins, the hip-hop-potamus or the rapping rhinoceros? Who will Jennifer HAWKins pick as her flock favourite? Humanimals is as funny as it is educational, not to mention packed full of talent. Jason Coleman, the show's producer and choreographer, really knows how to pick the perfect all-singing, all-dancing cast. From falling snow to giant glow-in-the-dark underwater critter puppets, a human-sized flying bee to a tree snake slithering around on aerial silks, there's plenty of 'wow' throughout the hour, and more than enough adult humour to please the grown-ups, too! Buy tickets to see The Humanimals by Jason Coleman at Cabaret Cathedral, and paw your way through the animal kingdom, in a way you've never done before. When: From Thurs 29 Dec 2016 to Sun 29 Jan 2017. Various times.